Young female researchers at the Department of Chemistry and Pharmacy at FAU are hosting the very first ‘Women in Science Symposium’ at FAU from 9 to 11 December. The unique aspect of this symposium is that all the members of the organisation committee and all the speakers are women. Renowned female researchers from all over the world will be presenting their academic successes and their career paths. The newly-appointed Bavarian State Minister of Science and the Arts, Bernd Sibler, will also be attending the event. In our interview, two of the seven members of the organisation committee, Dr. Alexandra Burger and Helen Hölzel, speak about what they hope to achieve with the symposium and why it is so important. How did you come up with the idea of organising the ‘Women in Science’ symposium? Dr. Alexandra Burger: The German Research Foundation (DFG) offered us financial support for gender equality measures via Collaborative Research Centre (CRC) 953. This is how we came up with the idea of organising a ‘Women in Science’ symposium. Gender imbalance still exists in most universities in terms of the holders of professorships and chairs, particularly in the sciences. We wanted to draw more attention to this fact with our symposium. On the one hand, our goal is to present the scientific achievements of female researchers, and on the other, to show how women can be successful in the field of science and academia. We therefore invited an international panel of speakers who hold high-ranking positions in academic fields. We were extremely pleased when several female professors from all over the world with remarkable career paths accepted our invitation to participate in the symposium. The subjects of the presentations range from inorganic and organometallic chemistry, materials sciences, organic chemistry, physics, and medicinal chemistry. We think it’s important that this conference offers something different to other scientific conferences. We therefore asked all the speakers to give presentations about their career paths in addition to presentations about their scientific achievements. Alongside presentations from the academic field, we have also invited female speakers from industry and from the editorial teams of peer review journals to provide insights into alternative career paths. Why is it important to hold a symposium with only female speakers? Helen Hölzel: Unfortunately, women are still in the minority in high-ranking positions, especially in the academic sector. In Europe, for example, they hold only 20 percent of these positions. We therefore would like to show that women can be just as successful as men in science. It’s our aim to motivate young researchers and inspire them with new ideas that could also help women to combine their family life with a successful career in science. It’s important to remember that the symposium is open to all, even though we only have female speakers. Both young male and female researchers and students are taking part in the symposium and will be presenting their own research in short presentations or poster presentations. The speakers will be speaking about their career paths. What do you hope the participants will gain from the symposium? Helen Hölzel: We would like to provide them with some insights into various careers, inform them about which obstacles young female researchers encounter and give them information on how they can succeed in science. The international nature of the panel means it will be quite interesting to see which paths women from different countries have taken. In addition, the speakers will be explaining why they took which decision during their careers, what and whom has influenced them and how they manage to balance a career in science with family life. What advice would you give women who are thinking about pursuing a career in research? Dr. Alexandra Burger: That they shouldn’t be afraid of taking this step. It’s not easy, but there are stumbling blocks whichever field you chose and it is possible to have a successful career in research and raise a family. Generally speaking, the critical issues involve financing and the time during pregnancy and maternity leave. However, there are some initiatives that provide women with special funding for these situations. I recommend contacting institutions such as the Office of Equality and Diversity at FAU or the German Academic Exchange Service (DAAD) to get an idea of the funding options available. There are several programmes that can make the beginning of a scientific career easier. This event will help students to get more information about them. Another important point is a scientific network. My recommendation for all those who want to be successful in science is that they build up a network as early as possible, set up cooperation projects at home and abroad and, of course, keep up with the latest scientific publications. This is the first time that you have organised an international symposium. Which difficulties did you encounter? Dr. Alexandra Burger: We had to learn a lot. Although some of us had already helped organise some conferences, it was a new experience for us. We were responsible for everything from deciding on the concept and programme to choosing speakers and creating the homepage, as well as advertising, organising everything, and arranging security. Aysun Çapci and Sandra Miguez Lago were responsible for registrations and the book of abstracts, Katerina Maxouti took care of the programme and accommodation, and M. Eugenia Pérez-Ojeda and I were the contacts for the invited speakers. Eugenia also organised the prizes for the participants and I was responsible for designing the homepage. Helen Hölzel designed the flyer and the poster and organised the catering and Ramandeep Kaur was responsible for transport. The multicultural backgrounds and various scientific disciplines of the organisation committee meant we all learned a lot from each other. And we have already had lots of positive feedback, which we’ve been very pleased about. Several successful female researchers have accepted our invitation and we have had many applications for short presentations, flash talks and poster presentations. We were also very pleased that the newly-appointed Bavarian State Minister of Science and the Arts, Bernd Sibler, accepted our invitation to attend. I think we all did a great job and we’re all looking forward to the symposium. The topic of the symposium is allotropes of carbon. What are they used for and what is the current state of research? What research is FAU currently conducting in this field? Helen Hölzel: Alongside forms of natural diamonds and graphites, synthetic carbon allotropes are one of the most promising families of materials. They have a great deal of potential for high-performance applications in areas of nanoelectronics and optoelectronics, hydrogen storage, sensors, and polymer strengthening. In addition, they seem to be more effective semiconductors than silicon. They can be transparent, flexible, highly resistant and lightweight. Their properties can be adapted to meet special requirements with simple chemical functionalisation. At the same time, they are ideal materials for investigating fundamental chemical and physical questions such as properties dependent on shape and charge, charge transport and the detection of supramolecular interactions. In CRC 953, chemists, physicists, and engineers are conducting research into the unique properties of these materials using modern techniques and analytical instruments and are learning how to adapt and use them to meet the requirements of relevant applications. On the one hand, working groups such as the groups led by Prof. Dr. Andreas Hirsch, Prof. Dr. Norbert Jux or Prof. Dr. Milan Kivala are working on the functionalisation of carbon allotropes, for example fullerenes, graphenes and nanotubes, as well as on the design of new functional materials. On the other, the research being conducted by Prof. Dr. Svetlana Tsogoeva is concentrating on medicinal chemistry, organocatalysis, multi-stage domino processes and the synthesis of new fluorescent aromatic and heteroaromatic compounds that could be useful in the synthesis of materials with semi-conductor properties and in molecular electronic devices. The functional materials created by these working groups can then be used by the other groups in the CRC to manufacture new functional materials, such as in the working group led by Prof. Dr. Dirk M. Guldi, which is investigating potential applications in solar cells or catalytic reactivity. Beyond the realms of research, CRC 953 offers support and strives to bring about the structural changes that are needed in science in an academic context in order to create a fair research environment for science in the future. The symposium is taking place from 9 – 11 December and is aimed at both male and female participants. It has been organised exclusively by young female researchers: Dr. M. Eugenia Pérez-Ojeda, Dr. Sandra Míguez Lago, Dr. Alexandra Burger, Helen Hölzel (M.Sc. ), Katerina Maxouti (M.Sc. ), Ramandeep Kaur (M.Sc.) and Aysun Ҫapci (M.Sc.). 16 female speakers from all over the world are taking part, including nuclear physicist Prof. Rajaâ Cherkaoui El Moursli from Mohammed V University, Morocco, winner of the L’Oréal-UNESCO For Women in Science Awards in 2015, Prof. Annick Loiseau (ONERA, France), and Prof. Nancy S. Goroff (Stony Brook University, USA). In addition, the symposium will feature short presentations, poster presentations and round table discussions. 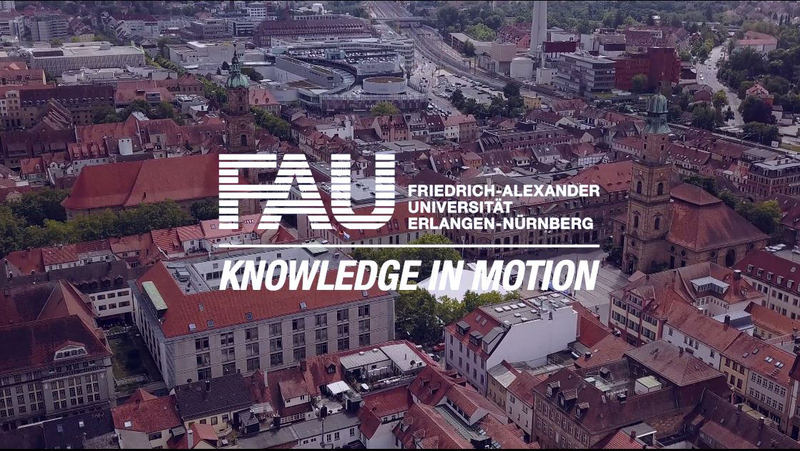 FAU President Prof. Dr. Joachim Hornegger, Prof. Dr. Peter Gmeiner, speaker of the Department of Chemistry and Pharmacy, and Prof. Dr. Andreas Hirsch, spokesperson of CRC 953, will also be taking part. You can find detailed information on the symposium´s website.